International Mobilization Day against Nuclear War is observed annually on January 28/29, the anniversary of adoption of the Delhi Declaration in 1985. Delhi Declaration was adopted in 1985 at the meeting of Heads of State and Governments of India, Argentina, Greece, Mexico, Tanzania and Sweden in New Delhi, the capital of India. These countries were the first to sign the document. The declaration called for an end of nuclear arms race and gradually eliminate nuclear arsenals around the world. The nuclear weapon was used only twice in 1945, when two bombs were dropped on the cities of Nagasaki and Hiroshima. Although nuclear bombs are not used any more, the creation of new kind of nuclear threat may become a political threat for many countries. The moratorium on nuclear testing in atmosphere was agreed by the USSR and the United States in 1953. However, the moratorium was broken by the Soviet Union in 1961 and by the USA in 1962. 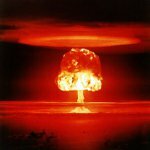 The United Nations Disarmament Commission prepared a treaty banning nuclear tests in atmosphere, outer space and underwater, that was signed by over 100 countries members of the UN, including the USA and the USSR. Another non-proliferation treaty was signed in 1968, that prohibited owning nuclear weapons to all countries, except the USA, Russia, France, the UK and China. In the mid of the 1990s the treaty was signed by 181 country, and in 1995 it was extended indefinitely.